We haven’t had a caption contest recently, so let’s get that restarted. It’s real simple to play — think of something funny / humorous to go with this picture. The only rule is to keep it clean. And regardless of whether you have anything to contribute, you can enjoy the comments other people leave, too. Let me also add that comments usually pour in over the next week, so this is the type of post that it’s good to check back on. You can also subscribe to the comments (whether for just this post or all comments) if you would rather be notified that way. caption contest, who can explain this one? We like to feature unusual photos for our weekly caption contest, to make it more interesting and more random. We’ve had some really weird pictures so far, but this may be the most random one yet. I challenge you to come up with a story that comes close to being plausible. Of course, you can also make jokes or funny observations, if you don’t care to try to explain it. Most of all, have fun with it. This week’s caption contest really needs your help in explaining it. 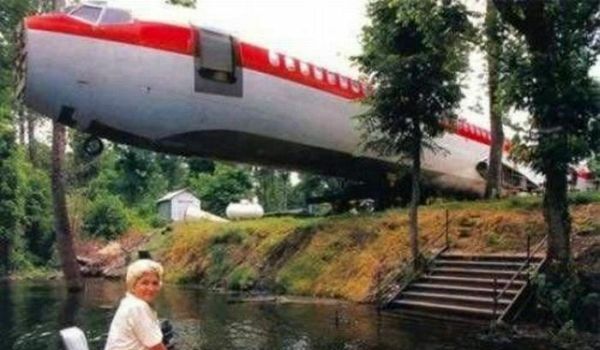 Obviously a jet crashed in some woman’s backyard. Or is that really what happened? How did this happen? Why? What should happen next? You decide. There wasn’t a caption contest last week because of Thanksgiving and my busyness, but this week things are back to normal. So let’s kick it off with a bang… or, rather, a crash. This week’s photo features a train wreck. 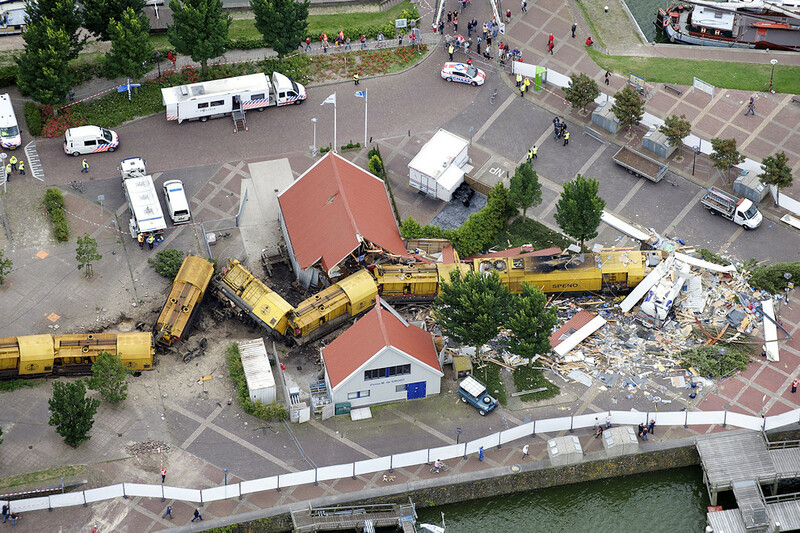 But this isn’t some normal derailment — this train went through a building. And the tracks aren’t even in the picture! So something extraordinary happened here. It’s up to you to write a story or joke to go with this. Here’s some starting points to help you think of something: Why did this happen? How could this have happened? Who was involved? What do the owners of the building think? What about the people watching? Or the cleanup crew? Remember, you can embellish the story however you want, or even just make it all up. The goal is to be funny, not necessarily realistic. Have fun with it. Let your mind wander. Welcome to our next weekly caption contest! The game is real, and the prizes are imaginary! Well, except that you can feel good if you write something funny — there might be thousands of people read it and be amused. This week’s photo features a man who appears to be doing a stunt on a bicycle (or about to wreck it). Is he trying to impress the ladies? Or do they have something to do with it? You get to write the context. Have fun with it. Just make it funny and keep it clean. Now that I’m back from vacation, let’s get the weekly caption contest back on schedule. While in Colorado, I saw a few bad drivers. 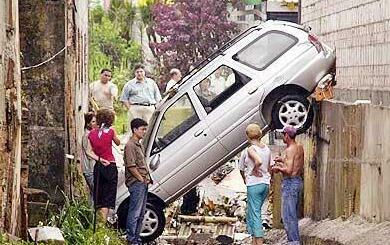 But none of the bad driving I saw can compete with this picture. Somehow a truck is on the roof of a house, and there’s a fair bit of destruction around it. 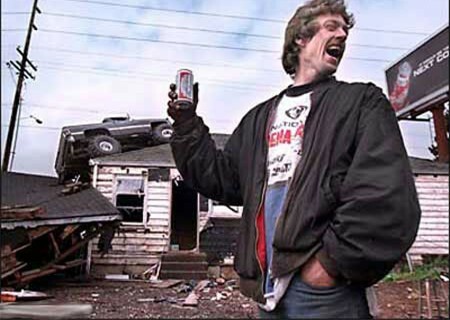 There’s also a guy in the picture, holding a beer and laughing. The actual context behind this picture is unknown, so make up whatever story you want to fit your explanation. 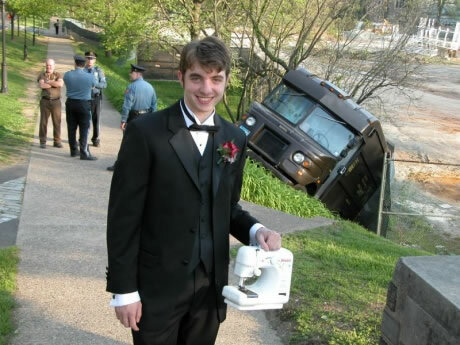 There’s a few obvious captions, but you can also use your creativity to come up with something really random.